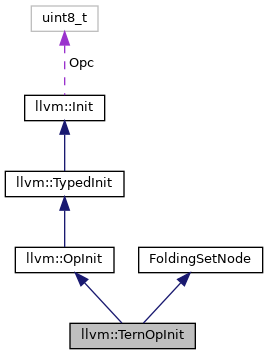 !op (X, Y, Z) - Combine two inits. Definition at line 859 of file Record.h. Definition at line 861 of file Record.h. Definition at line 874 of file Record.h. Definition at line 885 of file Record.h. References assert(), get(), getOpcode(), getType(), and llvm::ArrayRef< T >::size(). Definition at line 1128 of file Record.cpp. 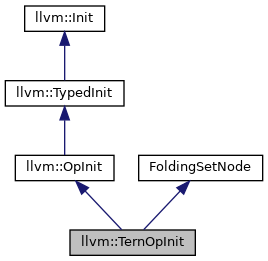 References llvm::dyn_cast(), ForeachHelper(), llvm::IntRecTy::get(), llvm::StringInit::get(), llvm::VarInit::get(), llvm::DefInit::get(), llvm::DefInit::getAsString(), getOpcode(), getType(), llvm::AMDGPUISD::IF, Size, and llvm::ListInit::size(). Definition at line 1054 of file Record.cpp. References Allocator, llvm::FoldingSetImpl< T >::FindNodeOrInsertPos(), I, llvm::FoldingSetImpl< T >::InsertNode(), and ProfileTernOpInit(). Referenced by clone(), and resolveReferences(). Definition at line 1247 of file Record.cpp. Definition at line 903 of file Record.h. Definition at line 904 of file Record.h. Definition at line 892 of file Record.h. Definition at line 902 of file Record.h. Definition at line 893 of file Record.h. Definition at line 905 of file Record.h. Definition at line 911 of file Record.h. Definition at line 1070 of file Record.cpp. References getOpcode(), getType(), and ProfileTernOpInit(). Definition at line 1217 of file Record.cpp. References llvm::ShadowResolver::addShadow(), llvm::Init::convertInitializerTo(), llvm::IntRecTy::get(), get(), llvm::Resolver::getCurrentRecord(), getOpcode(), getType(), llvm::AMDGPUISD::IF, and llvm::Init::resolveReferences().